If you are a proud "Do-It-Yourselfer", Klipsch has many speakers and accessories to choose from. Klipsch Custom-Install products are best suited for those who wish to hire a custom installer or audio integrator for their project. Check out these products to learn more and to connect with a Custom Install Professional near you. You have chosen a discontinued Klipsch product. For information on the latest personal music systems, please click here. This versatile audio surround sound system digital decoder/preamplifier is precisely crafted to bring you the most advanced surround modes including DTS Dolby Digital & Dolby Pro Logic. This system will reproduce six discrete channels of encoded sound tracks with true fidelity and sonic excellence. 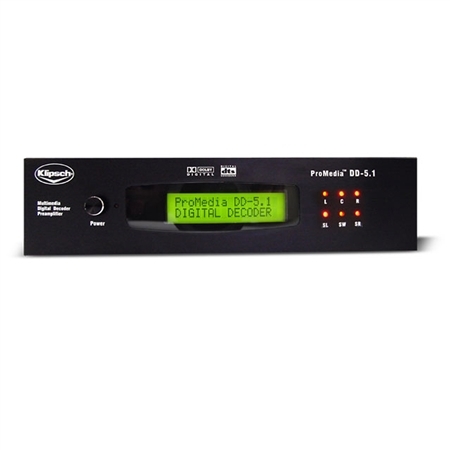 The ProMedia DD-5.1 automatically detects the type of signal present at each input and decodes it based on the original encoded software. For support information, please click the "question mark" button on the bottom-right of this screen. Designed and engineered with pride in Indianapolis. 0 products selected to compare.